Click here to purchase this book $109. Before a company begins exporting, it faces the initial problem of how to obtain customers in foreign countries and distribute products to them. Exporters may think of Direct Sales, or dealing directly with the buyer, as their best method of obtaining customers. The advantages of direct exporting for an U.S.company include more control over the export process, great control over the firm’s brand, potentially higher profits, and a closer relationship to the overseas buyer and marketplace. On the other hand, these advantages can be hard to come by, and there is a cost to achieving success through direct sales, whether in real dollars or time allocated by a firm’s personnel. The company and its management team are responsible for market research as well as planning and distribution of the product in a manner which will produce satisfactory sales results. 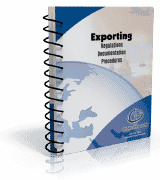 Global Training Center’s “Exporting: Regulations Documentation Procedures” was written by George W. Thompson and Catherine J. Petersen. and telecommunications products, aerospace, and consumer goods. Minnesota, and is a Licensed Customs Broker. Ms. Peterson’s trade books can be found here at GTC.